Twisted Pixel have given us some fantastic titles in the past. From The Maw, to 'Splosion Man, to Comic Jumper, each one has been vastly different to the last, and utterly unique. 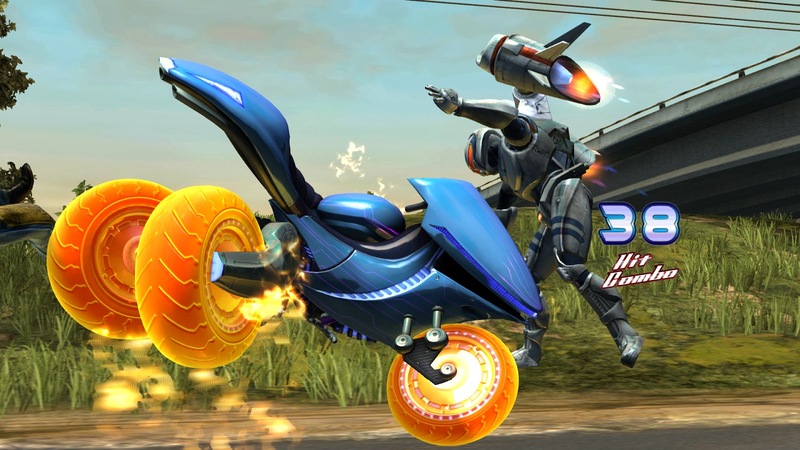 Their latest title, LocoCycle, is the story of a highly advanced combat motorcycle called I.R.I.S. (for the sake of the review, we'll call her Iris), and Pablo, a simple mechanic. It was one of the Xbox One launch titles, and has now been ported to the Xbox 360. Does it live up to the high standards set by Twisted Pixel's earlier titles? Read on to find out. The game opens with a fairly long live-action video, brimming with classic Twisted Pixel humour. There's a fancy gathering of bad guys and world leaders (plus Michael and Lindsay from Rooster Teeth!! ), all here for the same thing; weaponised motorbikes. And that's where we meet Iris. Iris is capable of 40 combat moves, can speak in 50 different languages and can travel at 180MPH. She's pretty impressive. Shortly after the presentation, she is struck by lightning and gains free will. Whilst Pablo the mechanic is trying to find out what needs fixing, Iris sees an advertisement for a freedom rally, and has an uncontrollable urge to go there. Unfortunately, Pablo's trouser leg is caught in Iris' wheel, so he is unwillingly dragged along for the ride. The goal of each level is to simply defeat all of the enemies as fast as possible. Now and then there's a boss fight, mini-game or QTE, which try to mix up the gameplay a little. 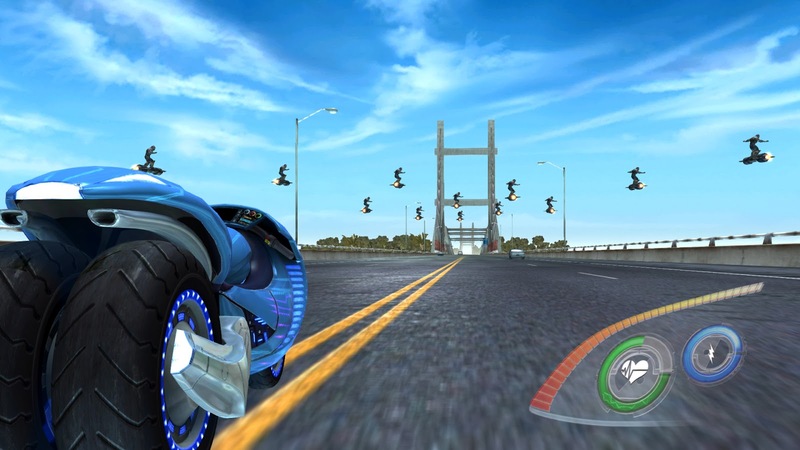 You control Iris as she speeds across the highways and dusty side-roads of the USA. The driving is hard to describe. For more precise turns like when dodging cars, it feels way too sensitive and you'll often veer out far more than you meant to. When trying to make sharp turns though, you'll more often than not just crash into the wall. It really is a bizarre driving mechanic, and it seems like a more traditional approach to the driving would have been a much better option. For combat situations, you can use Iris' automatic guns, and a couple of melee attacks. The guns are fairly hard to aim, due to the dodgy driving, and are initially very weak. Luckily, there is an upgrade system in place, which eventually lets you add spread shots and missiles to her arsenal. The melee combat is much more focused, as you lock onto enemies as you attack them. You could literally close your eyes and hammer the X button, and you would probably defeat the enemy. It's definitely more fun later into the game, when you have more attacks, power and a greater number of enemies to defeat. It does get very repetitive however, and each enemy just takes a little too long to kill. The enemies aren't challenging, and the combat isn't varied enough, so it can feel like a bit of a chore. The QTEs make for some awesome action on-screen, but they aren't explained very well. As your command appears on screen, so does a larger outer ring, which closes in on the button prompt. At no point does it tell you whether you're supposed to hit the button quickly, or whether you're supposed to wait till it's as close to the prompt as possible. Obviously, this only takes a couple of goes for you to work out which is the right one (wait till it's super close), but this shouldn't be the case - you should be told what you're supposed to do. There are also a couple of mini-games, such as one where Iris shuts down, and you have to fix her up again. You have to do a few different things, like holding two wires close together to arc the electricity and create a stable flow, inserting some screws and finishing with a good old fashioned kick. The first time this happens, it's an awesome surprise. It's not entirely exciting gameplay, but it's different, and a good game needs variety. But the whole thing happens again, a couple of acts later. You do the same tasks in the same order. Playing it the second time sullies your memories of the first, and it's a real shame. Graphically speaking, it's fairly inconsistent. Pablo and Iris look pretty decent, with impressively detailed models, but everything else is a bit lacklustre; the environments are notably bad. For a game that takes up around 4GB of hard-drive space, you would expect better, especially when you consider that this was a next-gen launch game. 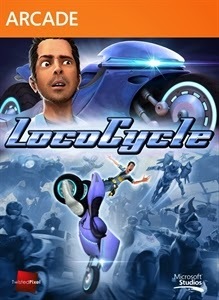 LocoCycle is an interesting idea, but it just didn't pay off. It might have worked as a section of a game, but to have it as the main feature clearly wasn't a good idea. It has poor controls, incredibly repetitive combat and a general lack of challenge. It's unusually poor for a Twisted Pixel game. Yes, they're taking chances in creating a unique videogame, which is fantastic, but not all risks are worth taking. Here's hoping that they come back stronger, and gain back the reputation that they're more than capable of upholding.